AKRacing Nitro Series ▷ Size & Buying Guide on GOTURBACK.UK! AKRacing is well known for their great quality gaming chairs, and the AKRacing Nitro doesn’t disappoint. Its sporty looking design and sleek red or blue and black colours will look great in any gaming room or man cave. It has a steel frame with rugged aluminium base and gas lift mechanism. Although it doesn’t have as many features as some of the more expensive gaming chairs on the market, the AKRacing Nitro does exactly what it says on the tin. It’s a great, functional, basic level chair that is comfortable enough for hours of gaming. The AKRacing Nitro gaming chair was designed with the user in mind. Although it offers basic features, that is in no way a negative thing. It suits the end user perfectly if all you want is a comfortable yet stylish chair. Whilst standard office chairs may be cheaper than the AKRacing Nitro gaming chair, they do not offer the same degree of comfort or support as a chair that has been designed for someone that may spend many hours in it whilst gaming. With a focus on design, ergonomics and functionality, the AKRacing Nitro gaming chair is ideal for spending hours – or even days! – without compromising on comfort or support. The AKRacing Nitro gaming chair has a five point star base with silent, floor friendly castors. This makes it ideal for gamers who play at night and worry about the sound of castors on the floor waking the household up! Its sturdy aluminium frame holds a sporty looking chair that resembles a racing car seat.High-density mould shaping foam covered in a leather cover provides comfortable seating that contours to the shape of your body. 2D armrests and a 12-degree tilt angle, as well as a gas lift to adjust the height, allows you to adjust the chair to best suit your gaming needs. 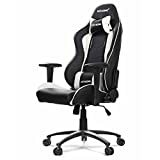 Lumbar and neck pillows provide additional support to the key areas that are likely to suffer from long hours of gaming, and a backrest that can recline between 90 and 180 degrees really do make this a great basic level chair that offers a great bang for your buck. The AKRacing Nitro gaming chair comes with lumbar and neck support cushions as standard. Whilst many chairs are only offered in one or two colours, the AKRacing Nitro comes in a choice of a whopping five colours! It is available in blue, white, red, orange or green, allowing you to choose a colour that best suits the room it will be going into. All of the colours have a real sporty look to them. The AKRacing Nitro gaming chair is designed based on a real racing car chair. The only difference is the extra padding and cushioning that makes this chair more comfortable and suitable for much longer use. The adjustability of the chair makes it ideal for individual gamers to find a position that is most comfortable for them. Although 3D or 4D armrests would have made this chair even better, the 2D armrests are comfortable and supportive. The chair can hold gamers weighing up to 90Kgs and 185cm tall, although to get the best out of the chair, 75kg and 175cm is probably the most I would go to.